WOW! Women On Writing Blog: Eric Trant Launches His Tour of "Risen"
Eric Trant Launches His Tour of "Risen"
Risen takes readers into a hellish world where none escape! Risen is available in ebook and in print at Amazon, Barnes & Noble, and IndieBound. To win a copy of Risen, please enter using the Rafflecopter form at the bottom of this post. The giveaway contest closes Sunday, September 10th at 11:59 PM EST. We will announce the winner the next day in the Rafflecopter widget. Good luck! WOW: Where do we begin? I know you so well Eric, and we've had two fabulous interviews in the past. This is going to be fun! I am in awe of all you accomplish! How do you find time to write and still keep a balance between your career, your family, your health, etc.? Eric: I don't watch much television. The only show I watch live is Walking Dead, and I record and watch Gotham when I get a chance. Back before digital recording, I had a VCR and my viewing was limited entirely to movies, no cable. In college, I owned a small television, and I only watched Star Trek or movies, barring classes. I worked at Blockbuster Video, so I watched quite a few movies on the weekends. So right there you can see I gain about six hours a day of free time. I limit my internet exposure as well, and while that may hamper my marketing, it gives me extra time for writing, reading, working out or family activities. WOW: I'm right with you when it comes to television, but I admire your ability to be so disciplined with social media! Way to go! When we first met four years ago you told me this: "I look around and wonder what the heck I was ever afraid of, and why defeat is even a word." In case you don't recall, that was just after you found our your wife was expecting and you had just left your corporate job to start your own company. Is that still your motto and what has either solidified that for you or changed your thinking? Eric: Oh, I remember, and hell yeah, that is still my motto. I left my corporate job to start a company in the oil field. It went along swimmingly until the oil field crashed, and I mean overnight the money stopped coming in. It happened during a single week, a big crash, all the invoices and agreements immediately put on hold as everyone buttoned up, and here I was with no income, and ineligible for unemployment because self-employed folks (LLCs) do not qualify. I was furthermore undesirable for re-hire, because companies considered me a flight risk. A standard interview question: What are you going to do when the oil field turns around? So my wife and I suffered an entire year without income, bleeding out our savings, trying to salvage the house and keep the kids in order. Now combine that with an ex-wife firing one lawyer after another coming after us for money that wasn't there. Oh, man my ex was raging pissed, even to the point of standing in front of my house with my son and some guy I never met, all three of them screaming at me. It was my legal time, she was in clear violation, but I missed a grand opportunity to see her in the back of a police car. Her guy even confronted me physically, on my property. Easy pickings and I missed it. So I took a job butchering at Tom Thumb. I at least knew a little bit about cutting meat, and I knew a lot about fish and shrimp (grew up on the coast, and my dad was a fishing guide), so I cut fish all day for $11 an hour. But I kept writing, and I kept fighting my ex, and I kept interviewing, and my wife stuck by me through this drama, and we all walked through it together. Now, even with all the angst my ex caused, my son is bouncing back emotionally. I found a job in corporate aligned with what I enjoy doing. I am finally able to pursue what is called a Six-Sigma Blackbelt, which is a high-end statistician position, and has been on my career path since the early 2000s, but without an opportunity to pursue it. My wife and I came out stronger, knowing we could weather such storms. My children gained a new understanding of what it is like to be divorced, and why honesty and transparency are critical features in any co-parenting relationship. My oldest son, the one in the tug-of-war and victim of my ex's deceit and sabotage for over a decade, is now a teenager growing into a man. He has gained an especially in-depth understanding of the agony some parents are capable of inflicting after divorce, and what it is like to endure, rather than inflict suffering. He is beginning to judge his parents for their actions, and I am fine with that. I'm not sure his mother will be so happy with his verdict. I gained a few new notches on my rifle for battles fought and wars ended. I may not have ~won~ every battle, or even the war, but no one can say I was ~defeated~. I certainly did not offer unconditional surrender. We'll just call it a cease-fire. And we all came out as good guys. As I say to my wife and children, Keep the cape on. We define ourselves during the dark times, and I believe we defined ourselves pretty well. So define yourself as the one who maintained their honesty and integrity, who fought with dignity and pride, and who can stand proud after the smoke clears. So for us and this family, defeat is still not a word we bring up. It simply does not happen in this house, and Lord in Heaven have we been tested from all directions. WOW: It's a mighty fine cape - I love that motto! What are you working on next? Eric: I'm drafting a book with a working title of WISH. It will remain in my chosen genre of supernatural-thriller, but will return to a modern, Southern Gothic theme. I'm focusing on a little girl and her older step-sister after they lost their brother, while their parents implode from the pressure of losing a child. I have it set in the Texas Hill Country, and it will include a spring-fed water well, a fae, lots of spiders and an Elsa doll. I'm just getting started, but I am excited about how it is going. Lord-willing, I'll have something in 2018 submitted, accepted, edited and published. WOW: Another one word title - I love it! Who has been your biggest supporter in your writing career and how so? Eric: Hands-down, my wife and family. My kids let me bounce ideas off them, and my wife patiently patronizes my ramblings about this or that story and whether it is catchy enough to pen out. My wife also humors me with my marketing, and is an active participant in spreading the word. It sort of embarrasses me sometimes, but she brags a lot about her author husband. WOW: You two are so cute - I secretly knew you were going to say that! I know you are a pay it forward guy, so who have you influenced when it comes to being fearless and writing? Eric: Two of my cousins are now in the writing space. One took it upon himself to ghost-write for another guy, inspired by the fact that if I can do it, he can do it. The other penned out a full novel, which I proofed for him and then encouraged him to do the ~hard~ work, which is edit your draft. That first draft is tough, but it pales compared to editing. I also participate in several online writing groups, and try to encourage my fellow writers whenever possible. Writing, and art in general, is an odd sort of competition. It reminds me of the games you play with your kids, where you let them win and celebrate their victories with them. We want everyone to come in first place. WOW: Tell us about your work space. Where do you go to write? Why is this space important? Eric: I'm a quiet-site writer, so anyplace I can park and write with few distractions. I wear my Bose headphones, the good ones that cancel outside noise, and I spin one song over and over to keep me in the mood. I used Seether's "Rise Above This" for RISEN, and am currently listening to "Wishlist" by Pearl Jam as I draft out WISH. I listened to "Pumped Up Kicks" by Foster the People for WINK, and Imagine Dragon's "Radioactive" when I wrote STEPS. I find that playing a single song keeps the worms warm and digging. I slip into a groove when I hear the song, and slide back into the story where I left off. And if you listen to that song as you read, you'll see it in the words. The right music is key. WOW: Wow! See, there's things that still surprise me about you! Love that song! What part does reading play in your writing process? What author has been most influential in your style? Eric: Reading is a huge part of writing. I never read casually, but always read critically, analyzing word choices, paragraph lengths, layout, punctuation and all the bones and joints and bloody nubs of the entire body of work. I even study cover art and spine layout on the shelf, and wonder whether color plays a part in the reader's selection process. I read every word of the book, inside the cover, the prequels and post-quels and all that legal verbiage from the publisher. I analyze every single word, because it must be important, or they would not have wasted the ink. In other words, I wonder about writing. I study it wherever I uncover a bit of written art, including blogs and facebook posts, newscasts and bathroom stalls and are those last two really any different? As for influential authors, there are dozens on that list, and perhaps I would say that every author inspires me to do something different. I see something I like, I integrate that technique. I see something which bothers me, I look for it in my work and massage it out. Still, I'll name drop and say Bradbury tops the list. That name gives me chills, and I have found a few of his original books here and there as part of a collection I'm building. They ain't cheap or commonly for sale. And for good reason. He is the only author whose book I will buy and read without hesitation or question, and I have read most of what can be found in the public domain. I immerse myself in his dreamlike stories, wander through his deeply descriptive scenes, and sing through his unapologetically poetic prose. I read Bradbury when I get stuck or bored with other writers. I read Bradbury when I begin to doubt greatness. I read Bradbury when I want to feel free again from the constraints of digitally modernistic, pre-constructed, cardboard writing. I have worked non-stop since my teens to inspire such unimaginable imagination in myself and others, and I hope one day I will do Bradbury justice in my works. I'm still at the foothills, as he might say. But I'm climbing, Mr. B., one handhold at a time! Just wait for me at the top. WOW: I want to say a special thanks to you for always choosing WOW and for not only booking your own tours, but also participating and supporting the tours of other authors. You are a stand up guy and we appreciate you! I personally cannot wait to see what's next for you and all of us here at WOW! wish you success on this tour and with everything you've got going on! Eric Trant writes today's guest post at Choices "Is a Career in the Arts (writing) Realistic?". Readers can find out more about Trant and his latest book Risen. "Say YES: Why Taking Chances is Imperative" is today's topic at Mari McCarthy's Create Write Now. Hear from author Eric Trant as he examines this important topic and shares more about his latest novel Risen. Eric Trant pens today's guest post at Writer's Pay It Forward. Today's post is titled: "Breaking In vs. Breaking Out: The Writer's Career Arc". Readers and Writers alike won't want to miss this opportunity to hear from Trant as well as finding out more about his latest novel Risen. Hear from Anjanette Potter of BookWorm as she reviews Eric Trant's latest novel Risen - this historical supernatural work of fiction is sure to please readers! Lisa Haselton interviews Eric Trant about his latest novel Risen. You'll want to learn more about this supernatural tale of fiction as well as the mastermind behind the dynamic writing. "Life Gets Better: An Angel Dad Reports Five Years Later" is today's post title at Hott Books. This touching true life tale is told by guest blogger Eric Trant as part of his WOW! Women on Writing book blog tour of his latest thriller Risen. 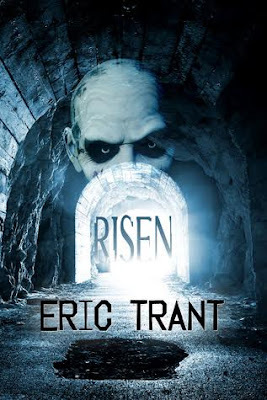 Crunchy Wisconsin Mama and Entrepreneur Tara Forst reviews "Risen" by Eric Trant. Don't miss this review and giveaway of Trant's latest thriller! Tess Fallier is today's guest blogger with a review and her thoughts on Eric Trant's Risen. Don't miss this blog stop! Reader and book blogger Crystal Otto reviews Eric Trant's Risen and shares her thoughts with readers at Book Santa Fe. Eric Trant visits Memoir Writer's Journey and shares his thoughts with readers of Kathleen Pooler's engaging blog. Today's post title is: "Setting: Its Role in Storytelling". Don't miss this chance to hear from the talented Eric Trant and find out more about his latest book Risen. Jodi Webb of Building Bookshelves interviews Eric Trant about his writing, his life, and his latest thriller! Don't miss this blog stop! Eric Trant is today's guest author at Karen Jones Gowen's blog Coming Down the Mountain. Read Eric's guest post titled "Luck: Its Role in Success" and find out more about his latest thriller Risen. Don't miss today's author interview at the blog of Author Shannon Muir - Shannon will be interviewing Eric Trant about his latest thriller "Risen"
Enter to win a copy of Risen by Eric Trant! Just fill out the Rafflecopter form below. We will announce the winner in the Rafflecopter widget on Sunday, September 10th! Eric--I was intrigued by your technique of listening to the same song over and over. I have a hard time writing with any music playing if the music includes lyrics. I haven't thought of playing the same song over and over. Perhaps I could do that, as perhaps the song would get so ingrained in my head, the lyrics would seem more like instrumentation than vocals. And although I have not read everything of Bradbury's, but I consider "Dandelion Wine" a book of poetry... it's THAT gorgeous. Good luck with your current WIP. Congratulations, Eric, on another successful book launch and this one sounds scary! Look at Crystal's first line of this post! Sioux, I'm the same as you -- lyrics distract me. But life is loud around me, full of distractions and voices and background music and televisions and it never, never ends. So I had to listen to ~something~ to dull out the chaos. That's when I discovered listening to just one song repeatedly. Not only does it become white noise to deafen the distractions, but it also helps slip me into the book with hardly any foreplay. Think of it as the KY of writing. Margo, it better be scary. Steven Novak over at WiDo Publishing did an amazing job on the cover, so the story needs to live up to those expectations. I think he nailed it. I hope I did, too. Fantastic, inspiring interview! I LOVE your book cover. It rocks! I'm a Bradbury fan, too. The Martian Chronicles is my favorite, and I loved his TV show. I'm also a Walking Dead and a Fear the Walking Dead fan. I love this interview more and more each time I read it! This is sure to be an amazing tour! Ang: For Bradbury, if you are a writer and have not read and studied his book Zen in the Art of Writing, it is a must-read. I have Martian Chronicles in hard-cover, original print, on my bed stand. I don't buy them online -- I could probably round out a collection with one or two clicks -- but prefer to find the books the old-fashioned way, by letting fate drop them into my hand. So it'll take a while to find his other stuff. Discovery is the fun part, and that's what I love about his writing. Every sentence is a discovery. I enjoyed thge interview very muich. Deborah, two words: Spill chick. Deborah, PS, I never use it myself, which is why I really liked your comment, which is why I was laughing. I disable it on my phone and just send what comes up. It's more fun that way. I enjoyed the interview. I look forward to reading the book. Looks like an awesome book. I look forward to reading this one!! I've been writing seriously since about 2000, but peckered around in high school and college during last two decades of the 1900s. I wrote a ton of short stories, maybe thirty or forty (lost count), and penned I think three novels before I finally found a publisher willing to accept my work. It was a very small publisher who is now out of business, but it introduced me to the industry and showed me the paths I had to forge if I wanted to be taken seriously. I kept writing unpublishable novels, maybe eight or so. It's hard to count, because so many are half-finished, or just drafts, or simply a kludge of thoughts that meandered nowhere for a couple hundred pages, or spreadsheets of plots and a few MS Word documents full of short stories and scenes that don't quite fit right. Then in 2012 I found WiDo Publishing. They are a medium-sized publisher meaning they have more than a single do-everything employee, and they maintain a working business model for their book rotations. RISEN is my third novel with them. As for my schedule, I write in the early morning hours, as many days as I can. I have been working on my next novel, and started a few chapters pitching different ideas before I finally settled on one called WISH, a supernatural gothic set in the Texas Hill Country. I've been writing on it several times a week, kick-starting my juices through those opening chapters, but once I get going, I'll write almost every day until I finish.